Jake Michael Singer explores the interplay between ascension and chaos in solo exhibition, “But a storm is blowing from Paradise” through photography, drawings and sculpture. Between September 20 and November 18, Matter Gallery proudly presents the dynamic solo exhibition, “But a storm is blowing from Paradise” by globally celebrated South African contemporary artist, Jake Michael Singer. Singer explores themes of ascension and progress in solo exhibition, “But a storm is blowing from Paradise.” Composed of installation, photography and sculpture, the exhibit serves as a meditation on the idea of societal advancement. Singer's photographs comprise sets constructed of found material and plastics on rooftops around the Johannesburg CBD and installations in the studio. Working with dancers, Singer creates absurd disorientating scenes that evoke tensions between the natural and synthetic; the chaotic and the ordered; the performed and the photographed. Here, Singer creates illusions around the body in space, through the intermixing of physical and digital space. Singer's three dimensional works also play with these themes. 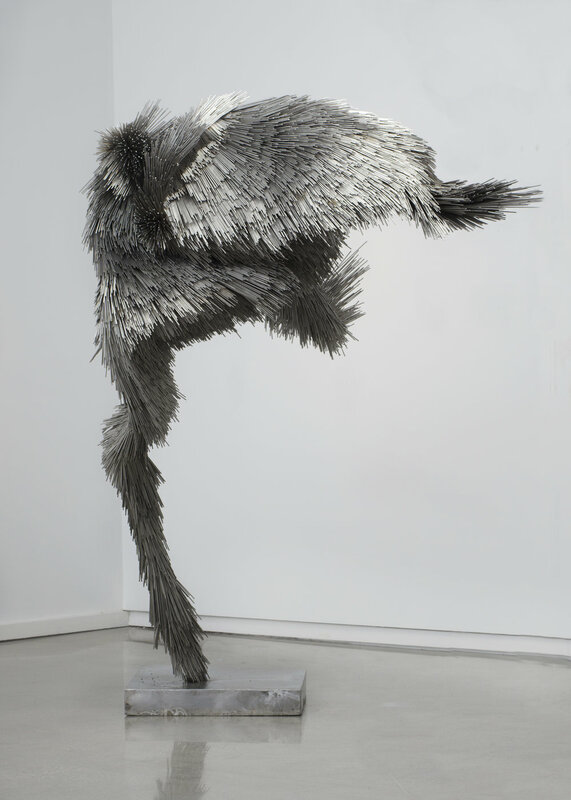 The exhibition feature sculpture, “There is humming in the air" is created using a technique that draws on traditional thatching and emergent behaviour. Emergent behaviour is a system that does not depend on its individual parts, but on their relationship to one another. This phenomena exists in the way birds flock, to the way the internet is organized, to artificial neural networks in computer science and robotics. Singer uses this principle in the organization of thousands of steel pieces, typically used for security fencing, to create a symbol of transcendence. Jake Michael Singer. b 1991, is a South African multidisciplinary artist. In 2013, Singer completed his bachelors at the Michaelis School of Fine Art, University of Cape Town. He has also studied at Central Saint Martins in London. Since graduating, Singer has held four solo exhibitions. These include Kalashnikovv Gallery, Johannesburg in 2018; Punt WG, Amsterdam 2017 and two at Hazard Gallery, Johannesburg in 2016 and 2017. Singer has participated in duo shows at Matter Gallery in Toronto 2017 and at 50 Golbourne, London 2017. Significant group shows include Emerge Art Fair in Washington, DC 2014, Art Lima 2015, FNB Joburg Art Fair 2016, Suba Biennale, Dak’art in Senegal 2016, Also Known As Africa (AKAA) in Paris 2016 and 2017, Cape Town Art Fair, 2017. He has also shown in Basel, Venice, Los Angeles and Perth. Recently he was selectedas an apprentice for Aida Muluneh in the Kampala Biennale curated by Simon Njami, 2018. In 2012 Singer assisted William Kentridge with The Refusal of Time. Singer is distinguished by a large scale steel sculpture at the top of the W+A Building, Johannesburg. In addition to the upcoming solo exhibition in Toronto, Singer is anticipating a solo exhibition Melbourne late 2018.